Beautiful certificate from the Mahoney-Ryan Aircraft Corporation issued in 1929. This historic document was printed by Goes Banknote Company and has an ornate border around it. This item has the signature of the Company's Secretary and is over 78 years old. Folds. T. Claude Ryan, best known for building the plane that Charles Lindbergh flew in his famous 1927 transatlantic flight, was born in Kansas in 1898. He learned to fly in 1917, was trained by the U.S. Army Air Corps, and served with the U.S. Aerial Forest Patrol. In 1922 he established the Ryan Flying School and a business in San Diego, California, for flying sightseers around town. In April 1925, needing capital, Ryan became partners with Benjamin Franklin Mahoney and formed Ryan Airlines. The company converted war surplus aircraft for civil use, rebuilding Standard open-cockpit biplanes to cabin transports. Ryan also acquired the Douglas Cloudster and used it as a passenger plane after modifying it to accommodate passengers in an enclosed cabin. He designed and built about 40 M-1 and M-2 mail/passenger transports in 1926. Ryan sold his interest in the company to Mahoney in 1926 but stayed on to manage the company. In early 1927, a group of St. Louis investors asked Ryan if he could build a plane for a nonstop transatlantic trip within 60 days. He accepted the challenge and produced the Spirit of St. Louis, which Charles Lindbergh flew across the Atlantic. Ryan, however, had no financial stake in the company and did not receive much in the way of tangible rewards. 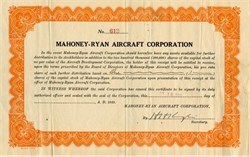 Mahoney formed the Mahoney-Ryan Aircraft Corporation in St. Louis, Missouri, in 1928, to capitalize on Ryan's name. The new company produced a number of airplanes but was acquired by the holding company Detroit Aircraft Corporation in May 1929. Detroit folded the next year and sold the factory in October 1930. Meanwhile, also in 1926, Ryan had established a separate, Ryan Aeronautical Company, primarily to import Siemens aircraft engines from Germany. In 1928, Siemens, which wished to establish its own distributorship in the United States, bought Ryan out for $75,000. With the money he received from Siemens, Ryan started a flying school in May 1928, and formed the Ryan School of Aeronautics on June 5, 1931. On May 26, 1934, he formed a new Ryan Aeronautical Company, and the school eventually became a subsidiary. The first design by the new company was the Ryan ST. The prototype's first flight took place from Lindbergh Field on June 8, 1934. The ST was a two-seat, open-cockpit aircraft with fabric-covered braced low-wings and an all-metal fuselage. A 95 horsepower (71-horsepower) inline engine powered it, giving the ST a top speed of almost 140 miles per hour (225 kilometers per hour). With its exceptional handling and speed, the ST caused a minor sensation at the time. However, only five were produced. Less than a year later, the STA appeared. Powered by a 125-horsepower (93-kilowatt) engine, this model set a number of light plane speed and altitude records and also won the 1937 International Aerobatic Championships, piloted by Tex Rankin. The next model was the STA Special, powered by a supercharged 150-horsepower (112-kilowatt) engine. This led directly to the STM (Sport Trainer Military) that had the same engine but a slightly wider cockpit opening to accommodate the wearing of parachutes.